Chestnuts have two skins. One is the hard outer shiny brown shell and the other is the inner thin skin known as the pellicle. Once cooked, their creamy-white flesh is similar in texture to a roast potato with a delicate, sweet, nutty flavour. The freshest Chestnuts have a glossy, brown, firm shell and feel heavy for their size. The firmer Chestnuts feel, the fresher they will be. Look for even-sized nuts which feel heavy for their size, with undamaged, firm shells. When baking, microwaving or roasting, firstly cut a shallow cross into the flat side of the shell. This prevents the nut from overheating and bursting while cooking. When boiling, cut the Chestnuts in half across the width of the Chestnut before cooking. Fresh Chestnuts can be refrigerated in a paper bag in the crisper for 2 to 3 days or in an airtight container for up to 10 days. Fresh Chestnuts are best if consumed within three weeks of purchase. Cooked Chestnuts can be kept in the refrigerator in an airtight container for up to 4 days. 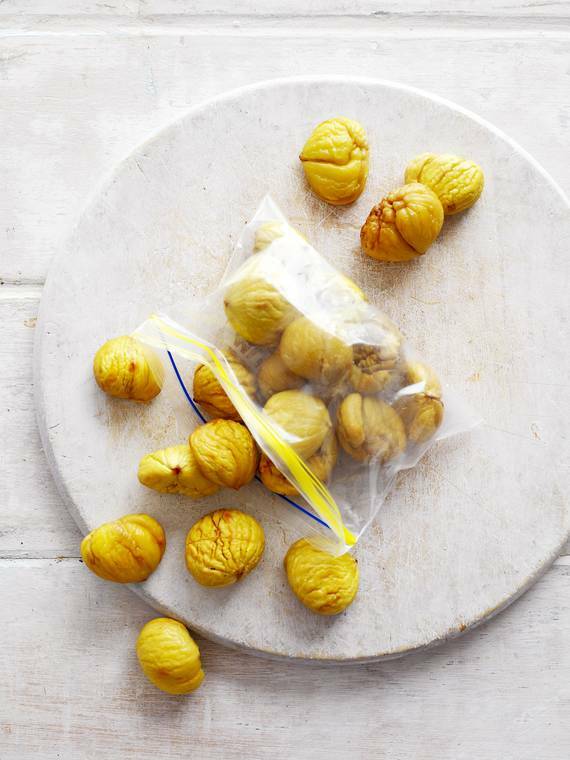 Peeled and unpeeled Chestnuts store perfectly in the freezer for year-round goodness.